Le Cabri The inviting mountain village of Val d'Isère guarantees a top-notch winter sports holiday. 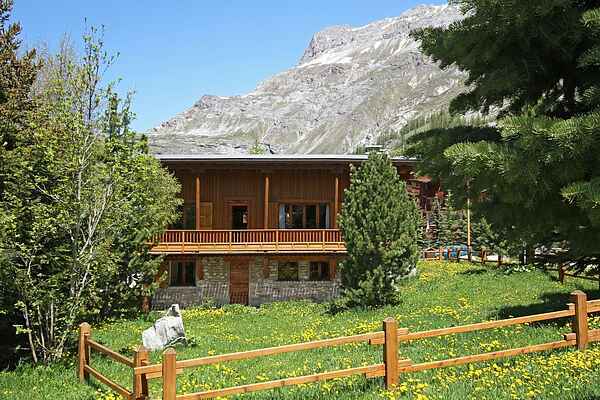 The chalet has a favourable location near the Bellevarde ski lift in the expansive Espace Killy ski area. You do not have to cross the road to get to the lifts. The location is quiet, in the cosy centre of town and within walking distance of all the great bars, restaurants and shops. FR-73150-14 The comfortable chalet (appr. 140m2), with its traditional architecture, is rustically decorated and features a large balcony with a beautiful view of the pistes. The smoke-free chalet has two levels and the top floor has many slanted ceilings. The living room on the first floor has a seating and dining area with fireplace and flatscreen TV, home cinema system, and DVD player. There's also a fully equipped kitchen. In total, there are five bedrooms: three with double beds (160cm) and washbasin (one of which has its own shower), one with two bunk beds, and one with two single beds and a washbasin. Two bathrooms with shower. Separate toilet. There is a room with a washing machine, a parking space for two cars, and a ski storage room with heated shoe rack.